As we come to the end of our series of Bio لوگ sessions for this semester, Team Senior Biology Society (SBS) would like to go out with a bang. 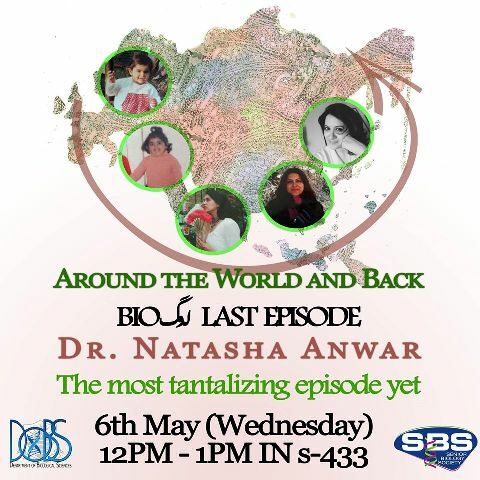 A personality we all admire, one reason or the other-an inspiration for many students from the start, Dr Natasha Anwar is the speaker of our final episode. 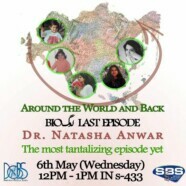 Dr Natasha Anwar, both a passionate researcher and teacher, will share her thoughts with us. Unlike any other Bio Loag, we’ll have more than just talk. In this finale, not only will there be a conversation but a fun video and an exciting quiz! Join us on Wednesday 6 May 2015 at 12:00 pm in S-433 for the epic finale of this semester.